There is no plainer passage of Scripture in the Bible concerning the way of salvation. Despite the idea that many have today, Christianity is not a way of salvation. Faith in Christ is not one of several options to make it to Heaven one day. Simply put, the only way to be reconciled to God is by Jesus having paid your sin debt. No other religion on the planet satisfies the demands of the righteousness of God. Man-made religions would have us to work our way into Heaven. All of them teach that, in some sense, our good must outweigh our bad. The problem with that idea is that God’s holiness demands that our sins be paid for. He cannot just sweep our wrongs under the rug and continue to be holy. A sacrifice must be made and this occurred at the cross of Calvary. Jesus plainly declares here, “I am the way”. Certainly, this reminds us of Jesus’ teaching in the Good Shepherd sermon. He said, “Most assuredly, I say to you, I am the door of the sheep” (John 10:7). Let it be known, there is no other door! If the sheep are to make it into the fold, they must enter through the only door God has ever supplied. That door is Jesus. In the same sermon He said, “Most assuredly, I say to you, he who does not enter the sheepfold by the door, but climbs up some other way, the same is a thief and a robber” (John 10:1). The same principle is true in both passages. There is one way into fellowship with the Father. That way is through the sacrifice of Jesus Christ. But one may say this way is too narrow. To this we reply, “Enter by the narrow gate; for wide is the gate and broad is the way that leads to destruction, and there are many who go in by it. Because narrow is the gate and difficult is the way which leads to life, and there are few who find it” (Matthew 7:13-14). So, the idea that this is a narrow way is true. To the natural man, it certainly may be “too narrow”. However, the way of salvation is a narrow way. Every other religion that seeks for man to be reconciled with God through any other means than Jesus Christ is a lie. He is the way – the narrow way! Another may declare that this simply doesn’t seem right – it seems unfair. 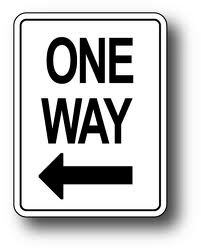 To this we reply, “There is a way that seems right to a man, but its end is the way of death” (Proverbs 14:12;16:25). Man had no ability within himself to draw up the plan of salvation. After the Fall, man was completely corrupt and had no spiritual ability to fix his error. The deed was done. So, our merciful and gracious God lovingly drew up the covenant of redemption in which the Son intervened for sinners by paying the price of their sins. Simply put, Jesus took the sins of His people on himself and paid the eternal cost of them. That’s God’s plan and, therefore, it is the only plan. So, the question today for you is, are you trusting in salvation through what you’ve done or are you trusting in the salvation that God provided through Christ? The Scripture plainly declares that Jesus’ work on our behalf is the only way to God. Our prayer is that God has given you the gift of faith to trust in Him alone.